Espirit-de-Corps The spirit of comradeship and brotherhood of the brave, regardless of caste, creed or religion. The motto is, "One for all and all for one"! Spirit of Selfless Sacrifice The tradition is never to question, but to do or die for the three "Ns"; Naam, i.e. name-honour- of the unit/Army/Nation, 'Namak'(salt) i.e. loyalty to the Nation, and 'Nishan', i.e. the insignia or flag of his unit/regiment/Army/Nation which the soldiers hold afloat willingly. Valour Fearlessness in combat and in the face of the enemy even when fighting against great odds or even when facing sure death. 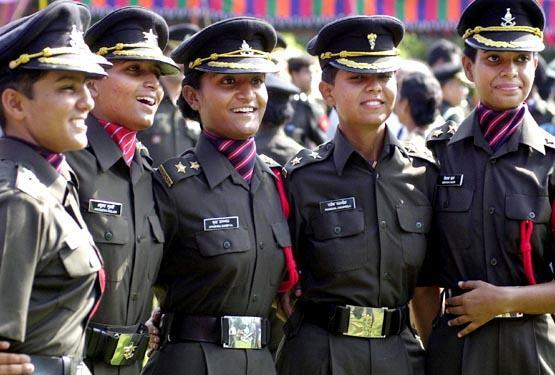 Non-discrimination The Indian Army does not discriminate on account of caste, creed or religion. A soldier is a soldier first and anything else later. He prays under a common roof. It is this unique character, which makes him bind in a team despite such diversity. Fairness and Honesty The spirit of honesty and fair play. He fights for a just cause that extends even to the enemy (prisoner or wounded). Discipline and Integrity Discipline and integrity impart the feeling of patriotism, honesty and courage under all circumstances, however strong be the provocation otherwise. Fidelity, Honour and Courage He is a man on whose shoulders lies the honour and integrity of his nation. He knows that he is the last line of defence and he cannot fail the Nation. Death to Dishonour A close bond amongst soldiers forces them to choose death to dishonour. The concept of 'IZZAT' (HONOUR) in the clan / unit enables them to shun the fear of death; to be called a coward in the peer group is worse than death. Forthrightness A soldier has to be forthright, for on his word the men he leads are going to lay down their lives without questioning why. These values stoke the attitude of Service before Self in every soldier. The famous credo of Chetwode Hall is deeply imbibed in the men in Olive Green. It is the spirit of this credo, imbibed in every officer that binds him with his men in an unshakeable bond of camaraderie. Your own ease, comfort and safety come last always and every time. The greatest binding force in the Indian Army remains unit cohesion and tradition. Truly heady is this mixture of Unit identification and traditions of sacrificial valour, handed down through centuries. At one point, victory or defeat becomes irrelevant. What matters is - Has the unit measured up? The Indian Army has time and again lived up to its tradition of valour, heroism, sacrifice and fortitude. It stands vigil along the border, watchful, prepared for any sacrifice so that the people of the country may live in peace and with honour. The Indian Army is that and much more.